There are real benefits to one-on-one time with an instructor. Agility involves a steeper learning curve than the newbie might imagine, and sometimes the amount of information can be overwhelming, especially to a person who hasn’t developed any dog-training skills prior to taking agility lessons. Private lessons can be booked on an ongoing basis or for occasional extra help if you have something you are struggling with. 1st lessons: $60 for 30-40 minutes. I will assess you and your dog's current skills and we will discuss agility traning fundamentals. If you decide after the first private lesson that you would like to enroll in group classes instead of continuing with private lessons, I will offer you a $10 rebate on your first group class. Subsequent private lessons: $45 for 30 minutes / $60 for 45 minutes / $80 for 60 minutes. I can really tailor the lesson to the specific needs of the dog and handler. We can break down behaviours into tiny increments and work at your pace. If more clarification or more time on an exercise is needed private lessons will allow for that. I can check your homework and nip problems in the bud. In a group class I can’t check everybody’s homework every week or that would take up all of class time. There’s nothing worse than realizing that you’ve practiced something wrong for a month. With the personal attention I can give you in a private lesson, I can give you feedback every week. Some people are uncomfortable taking classes in a group setting and are much happier taking private lessons. If class needs to be rescheduled due to weather or life-conflicts, it is easier to find a mutually suitable time when fewer people’s schedules need to be taken into account. More bang for your buck and your progress will be faster! Teaching your dog to weave properly is quite complex. Some dogs never learn to weave at all, some dogs weave but don’t perform the obstacle correctly in its entirety, and some dogs weave unreliably or inefficiently. Many students give up and accept substandard weaving because teaching your dog to weave takes quite a bit of work. Teaching weaving takes time. But this time can be cut down if you take private lessons because I can make sure you are on the right track. In the past year, it took one of my dedicated group-class students 9 months to teach her dog to weave whereas it took a dedicated private lesson student 5 weeks to teach her dog to weave. Really! Pixel is the 2nd dog with whom I have done serious agility training. She is a tricolour sheltie, a rescue that I adopted at 6 months of age and I started her in classes when she was 1 yr. Initially very shy she seemed to make fairly good progress with her training but I really wanted to teach her the 2X2 method of training for weaving as it teaches the dog to do the “weaves” independently. I was struggling with the steps and needed more help so I decided to try some private training with Sylvie. I am not sure who is more amazed and thrilled with Pixel’s progress, Sylvie or myself! Pixel and I were able to work at our own pace and being good at pinpointing problems Sylvie was able to correct errors right away. She could tell me exactly what Pixel was doing (which you can’t always see for yourself when working with the dog) and was able to suggest things to practice, specific to her/our needs. Sylvie is very committed to her dog training. Thank you Sylvie for your help, enthusiasm and positive feedback. Private lessons are tailored to you and your dogs needs and will help you get a handle on all the foundation skills needed to be successful in agility! 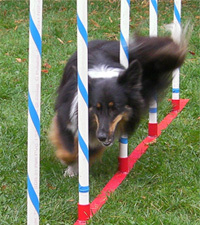 Please contact me if you are interested in registering for private agility lessons.